"With every new pair you purchase, TOMS will give a pair of new shoes to a child in need." 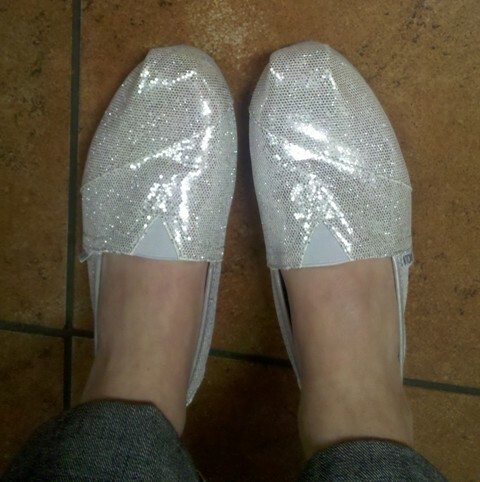 I just LOVE my new Toms Silver Glitters- they are beyond comfortable. Oh, and Billie Jean keeps playing in my head over and over today. Weird. I did a post on TOMS a while back. This truly is a wonderful company! the message behind them is marvelous and the glittery ones are soooo cool!!! Happy Monday! Tom's are great, aren't they?! What a great cause! Cute sparklies! I almost bought these this summer, but I can't decide if they look weird on me or not. I will probably get the point when I don't care and will splurge out of pure comfort :) cute! My sister has those and she wore them to homecoming! So cute and FUN! I love everything about Toms...mine are plain Jane off-white canvas ones and I wear them constantly (even when I know they don't go with my outfit). I wash mine pretty often...any idea if you can wash your sparkly ones? Ohh love- I want the gold ones still! I always get a kick out of these.... I went to school with Blake, the founder. Junior high and high school. Then my younger sister played soccer with and went to school with his younger sister, Paige. Not that we're super close best friends, but it is kind of strange. usually I think these shoes are high on the ugly scale. But the sparkles? yes, I get it. Super-fly! Love the sparkles. I keep considering the gold ones myself. Love the idea behind Toms! Love the sassy sparkles! I have the gold sparkleys!! I literally wear them all the time! !